KaBoom! 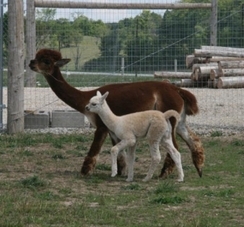 with his dam Kalee. Playing with Tansy, born the same day. I can turn faster than you can! KaBoom!, what a great name as he was born during a thunderstorm. KaBoom! 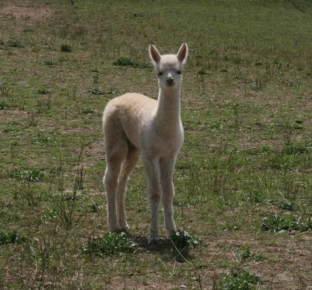 is a nice very light fawn, almost a peachy colour male out of R&R Kalee and sired by RR Samoa of R&R alpacas. KaBoom! is very dense with medium crimp but very fine fibre, at 3 years old he is only 19.6 microns. 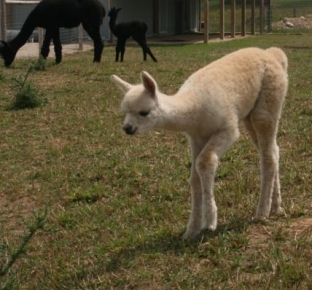 He has great length too, at the age of 7 months his fibre was over 5 inches long, it is still over 4 inches. KaBoom! is pretty easy going, he often attends the farmer's markets with his buddy Sampson. KaBoom! 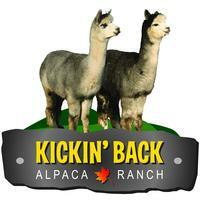 has started his breeding career, his first cria is on the ground.